One of the main architects of perestroika, Alexander Nikolaevich Yakovlev died on Tuesday. He was 81. Born in the village of Korolevo near Yaroslavl in 1923, Yakovlev was of the first generation reared under the Soviet system, and ironically, was instrumental in bringing its collapse. Like so many of his generation, he fought in the Great Patriotic War at 18 years old, where he sustained disabling wounds in 1943 fighting near Leningrad. He joined the Communist Party in 1944 and his Party membership gave him the opportunity to earn a doctorate in history from the Academy of Social Sciences in Moscow. Like so many ambitious Party members of his generation, Yakovlev was quickly shot up the State apparatus. When Khrushchev gave his “secret speech” denouncing Stalin’s cult of personality in 1956, he was a member of the Central Committee. In 1958 he studied at Columbia University as part of an exchange program. In 1965, he joined the Party’s propaganda department. Eight years later he became an ambassador to Canada. It was then he met Mikhail Gorbachev, another young rising star in the Communist apparatus. They formed comradeship which would lead to the institution of the most sweeping reforms the Soviet Union had known since Stalin’s Revolution in the 1930s. However, while Stalin’s revolution entrenched Communist hegemony over Russian social, political, economic, and cultural life, Yakovlev and Gorbachev’s “revolution,” which was encapsulated in the terms “perestroika” (reconstruction) and “glasnost” (openness), unlocked the remaining vestiges of Stalin that more moderate reformers like Khrushchev failed to undo. At the time, they had no desire for their reforms to become revolution; perestroika was an attempt to save the Soviet Union, not destroy it. But history got the better of both men. Their policies took on a logic of their own, and like so many other times in history, the men’s firm grip on its reigns slipped their grasp. The question now is how Yakovlev be remembered. His death brings another opportunity for Russians to continue to revaluate perestroika and the collapse of the Soviet Union, a process which began earlier this year with the 20th anniversary of the reforms. I was in Russia then, and it was interesting to see interviews and discussions with Gorbachev and Yakovlev dominate the television. For many Russians who lived through those changes, there was a deep ambivalence to the anniversary. The television images of long lines and Gorbachev’s insane ban on alcohol brought back mixed memories of a simpler and predictable time. It was also interesting to see the family I was staying with try to explain life under the Soviet Union to their 18 year old daughter. It was difficult for them to convey the complexity of life then, and how it wasn’t so easy to completely praise or condemn it. In the end, Gorbachev, who for the last 15 years has been reviled by many Russians, got a more favorable assessment from the family. 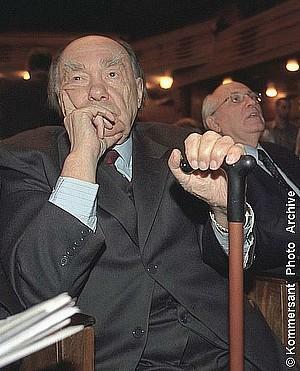 Without Yakovlev and Gorbachev, they wouldn’t be living as they do now. A life they view as much freer and open to opportunity for their daughter, though without the guarantees of security.